Years in the planning Russia's Second Kamchetka Expedition departed from the shores of Petropavlovsk-Kamchatsky with the two ships the St Paul and the St Peter in May 1741. The expedition leader Vitus Bering commanded the St. Peter and Aleksei Chirikov the St. Paul across the expansive eastern waters toward North America. In late June a rough storm forever divided the two ships. 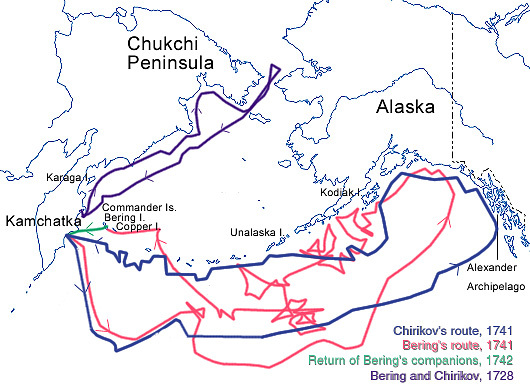 Below one can see their path, Bering in red and Chirikov in blue. From Kamchatka they kept pace with one another in trough and arc movement in the lower left of the map. Then they separated, heading their own directions, with Bering doubling back for a bit, correcting himself and heading southwest. In the longterm Bering's red route (above) proved more than slightly troubled, ending with the crew losing their commander and ship less than 300 miles from Kamchatka. In a previous post I marked the first contact Bering's party made with the Unanagan people by reading a section from Gorg Steller's journal, a naturalist who was part of the crew. 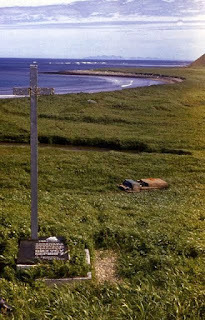 Bering lost his life, the St. Peter was destroyed, and the crew stander on the Commander islands only 20 miles from Kamchatka for months, as they rebuilt another ship. Following the blue line one can see that Alexie Chirikov's course led the St. Paul east, toward what is now called Alaska's southeast (or an area non-Alaskans label part of the 'Northwest'). Chirikov's party traveling aboard the St. Paul, the blue line, turned north eventually reaching Haida, Tsimshian, and Tlingit coastal territories. The crew saw land at Baker Island off Prince of Wales Island at the south end of what it now the Alaska panhandle, approximately 450 miles southeast of Bering's landfall near the mountain, Yasʼéitʼaa Shaa, meaning "mountain behind Icy Bay," or Shaa Tleinat "Giant Mountian," near the north end of the panhandle, (officially called by the United States and Canada as Mount Saint Elias). Unable to locate a suitable harbor the St. Paul sailed north along to meet with Sheet'-ká X'áat'l, now known more broadly as Baranov Island. In these waters the commander sent out a longboat with a crew of to find an anchorage site to which they could take shelter. On July18, ten members of the crew, including two siberian guides embarked toward the shoreline. Historians Bland and Grinëv detail that, "they were all armed with guns, straight navy broadswords, and cutlasses, and in addition they were given as mall copper cannon and two signal rockets. Dement'ev was ordered to be very careful and to try to gain the trust of the local inhabitants with small gifts in the form of kettles, beads, Chinese tobacco, smoking pipes, fabric, needles, and silver coins." This party never returned to the St. Paul. After a few days Chirikov sent a smaller party of 5 men to search for the missing ones. This group of sailors also disappeared without notice. After a few more days Chirikov set up closer to the shore firing cannons in hopes of catching the attention of the missing crew members. As they searched they saw two canoes approaching them, with Native who waved their arms, yelling "Agai! Agai! "Then the boats returned to the shore. Renowned scholars of Tlingit History, Language, and culture, Nora and the late Richard Dauenhauer, have put forth that the Tlingit party were exclaiming, ""Ayx?a\"or "Row!" perhaps as they returned to land. On the 27th Chirikov sailed west without his crew members. Historians tell divergent narratives about the fate of the men the St. Paul left behind. In "Reflections on the Fate of Alexei Chirikov's Missing Men" scholars Andrei V. Grinëv and Richard L. Bland debate the current literature surrounding the possible destiny these men faced after they left the sight. Many scholars suggest that the Tlingit captured the crew either taking their lives at that point or impressing them into service for a Tlingit family. Yet even more scholars discount such a proposed fate by insisting that due to the being deep into fishing and hunting season, Native people would have been less concerned about fighting with the crew members than with stocking up for the coming winter. Based on traditional stories, the honored late Tlingit scholar Mark Jacobs, Jr., put forth that the crew members meeting with Native people decided to stay on land because life on the ship, under military disciplined confines, left the men scared to return. These men married into families and their descendents became clan leaders. Often ship's officers used nefarious methods to enlist men on board. After sailing through the Bering, the St. Paul, low on food and water, without a distinct direction of travel perhaps convinced these sailors to spend their days in Tlingit territory, adopting into clans. In the past 270 years Russian artifacts have been found in villages, that are said to be dated back to around this time. There is also an oral history of Chief Annahootz, meaning "Grizzly Bear," disguising himself as a bear as to ambush the shored crew members. And perhaps in this meeting the crew members decided to stay on the mainland. Nora Dauenhauer and Richard Dauenhauer. Haa Shuka, Our Ancestors: Tlingit Oral Narratives. Seattle/London: University of Washington Press/Sealaska Heritage Foundation. - 1990. Jacobs, Mark. “Early Encounters Between the Tlingit and the Russians,” in Alaska History, Number 35: Russia in North America: Proceedings of the 2nd International Conference on Russian America, edited by Richard Pierce, pp. 1-6. Fairbanks, AK: The Limestone Press, 1990. 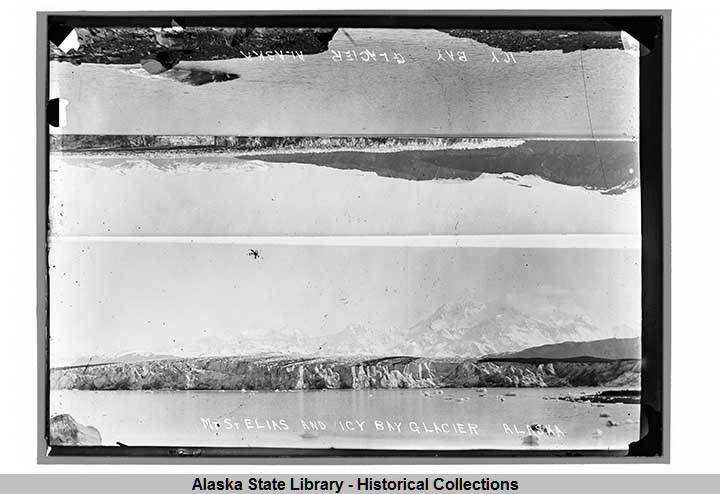 Lydia Black, Russians in Alaska. U of Alaska press, 2004.